Campaign for the American Reader: What is E. E. Cooper reading? 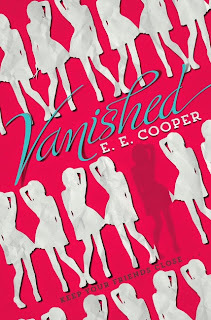 Featured at Writers Read: E. E. Cooper, author of Vanished. Gone Girl meets Pretty Little Liars in the first book of this fast-paced psychological thriller series full of delicious twists and turns. Then Beth vanishes. She skips town on her eighteenth birthday, leaving behind a flurry of rumors and a string of broken hearts. Not even Beth's best friend, Britney, knows where she went. Beth didn't even tell Kalah good-bye. One of the rumors links Beth to Britney's boyfriend, and Kalah doesn't want to believe the betrayal. But Brit clearly believes it—and before Kalah can sort out the truth, Britney is dead. When Beth finally reaches out to Kalah in the wake of Brit's suicide, Kalah wants to trust what Beth tells her. But she's swiftly realizing that nothing here is as it seems. Kalah's caught in the middle of a deadly psychological game, and only she can untangle the deceptions and lies to reveal the unthinkable truth. Learn more about Vanished at E.E. Cooper's website. Writers Read: E. E. Cooper.